In the middle of the night when my legs start twitching for their 4:30 AM run. At the stroke of my arm as the sky blooms purple over the pool water and the crows take wing. Between the happy boisterous noise of two young children. Through the holiday season, put on hold as my hands perform the necessary tasks of “making Christmas.” Over the air in the spaces between my neurons and never near paper or keyboard. Or perhaps there has simply been too much to choose: write or read or sleep (sort of) in order to run/swim early or wrap presents or cuddle with a child or a husband or plan lessons or…? I’ve tried to wait to write in this blog until having a clear topic, or even until the words (as they usually wish to do) fly out of their own accord. Strange, to have to nudge words sometimes. They can be finicky little creatures. Part of me…and yet possessing a mind of their own. I’ve always felt myself to be their conduit more than their owner or creator. I am a little bit lost without them so near. Even this morning after catching up on a favorite blog written by a former student of mine and reading of her challenge to us to pick a word as the theme of our year, I spent four miles of road and 100 lengths of the pool trying to come up with my word so I could follow along with her writing assignments and suggestions. I could have swam after that one ideal word all morning and never caught it… Oh, I came close to grabbing it, when suddenly it would dart away and leave ghosts in its wake: “eager,” “generously,” “wonder.” I couldn’t even decide whether to shoot for a verb, an adverb, or a noun. And then on top of that, I started to detest every word that seemed to emphasize me and how I would feel and what I would do all year and tried in vain to think of a word to capture some way to give or to interact with the world around me. A single word: exhaustingly elusive. Far and away our biggest news is that we bought a piano, a 48 inch upright new Schimmel. It came down in my mind to the piano, or having another experience for which I have been longing and loosely planning for a couple of years. We know who we are when we have to make choices, and I celebrate having to make one this month. In the end, choosing the piano felt clear and easy. 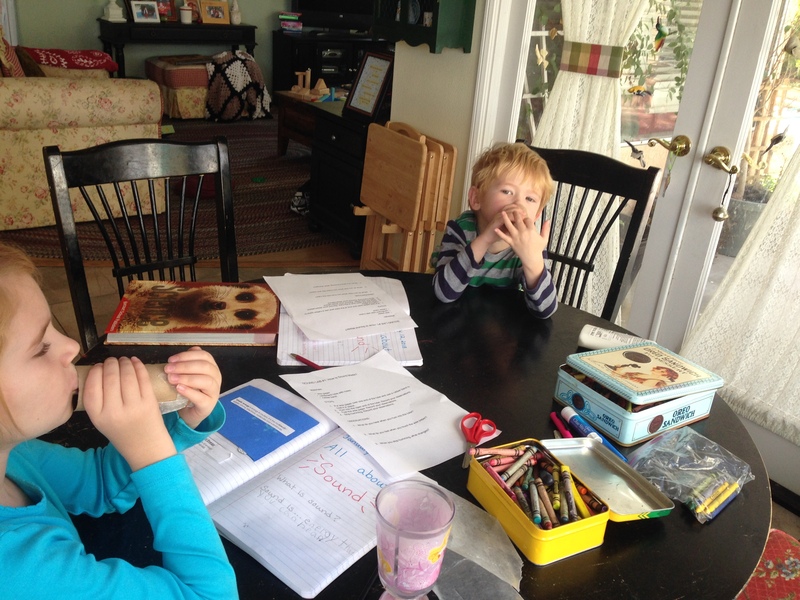 Both Katie and Eric love their lessons, accomplished their first recital in early December, and more to the point, show promise—especially Katie at this point. She has found part of herself at that instrument, practicing without being asked, teaching herself new music, and already starting to pick up sight reading in just a few months. This is my chance to give my children music—for the rest of their lives, a lifelong gift, a gift I believe benefits every child. 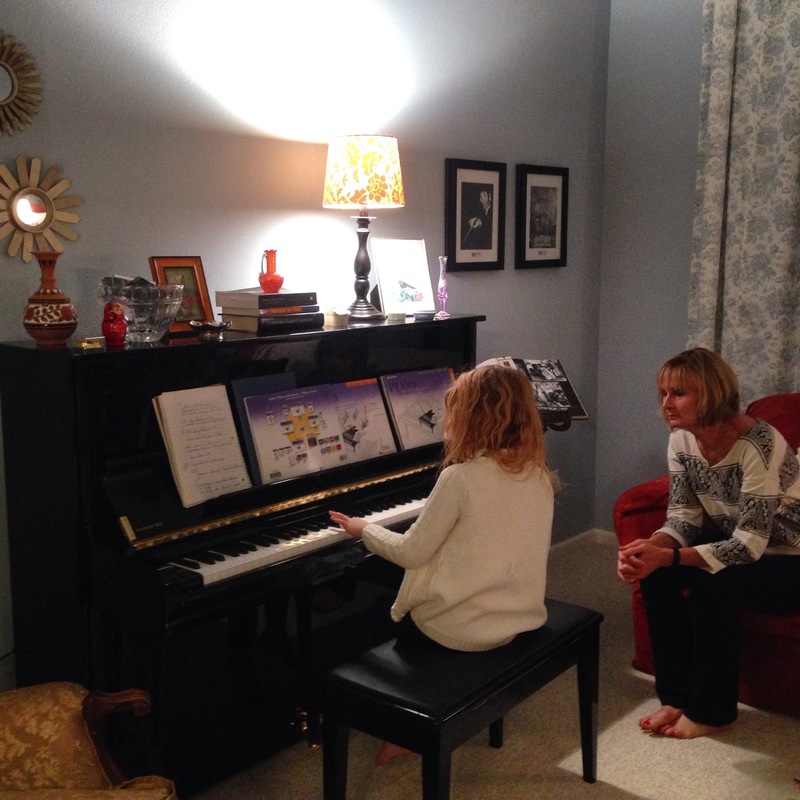 Katie and Eric know that they are to take piano lessons for a minimum of three years before even discussing a switch of instruments or a cessation of lessons. Fortunately, both of them seem to be taking to it. I bought this piano for myself, as well. I have never had music, and I am determined now—armed with the determination with which I have approached my running, so that’s significant—to teach myself music. I practice everyday. I work through both of the children’s lessons, I practice sight reading, I play my scales, I read bits of theory, I have taken all of our Music Together songbooks (which have simple sheet music inside for every song for three years) and have taught myself several songs already. I strongly view the acquisition of music to be a fundamental part of a well-rounded Renaissance education. At Stanford, almost everyone I encountered played some form of music, and I was embarrassed about not being able to do the same and tried to keep that fact concealed. Even now, it is scary to admit I have hardly a clue at all about a discipline so accessible to so many. But oh well. I am very late to the game, but I am finding that sheer will and consistency (along with a penchant for codes and languages, in this case) can crack even the most improbable nut. With that sheer will and work ethic I became a significantly competitive division and gender runner, after years of being overweight and not athletic—-so why not a pianist? Why not go be everything I have ever wanted to be? Why not learn everything I have ever wanted to learn? It’s never too late to create ourselves and to address our weaknesses. 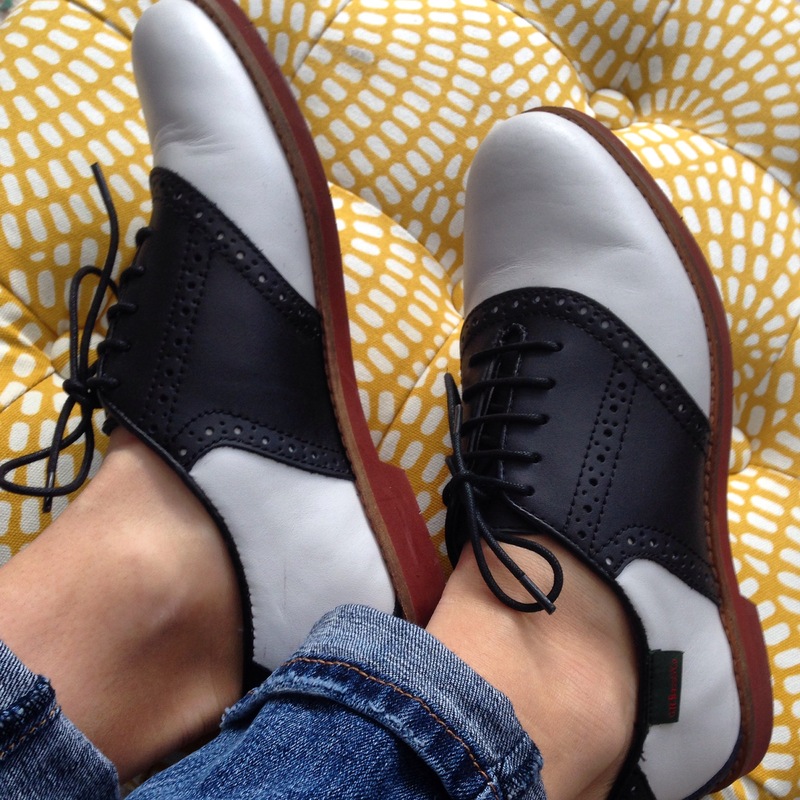 This proper pair of Oxfords definitely captures my style and mood lately. With the arrival of the piano, I completely restyled the living room, which I am now calling the parlour (with a “u” even) simply because I can. Mostly I made use of what we have had, kept, or lost in bookshelf corners for years, although I did end up buying an ottoman, starburst mirrors, and a few pillows to freshen the look, achieve the mid century modern style of which I am so enamored, and to tie the room together. 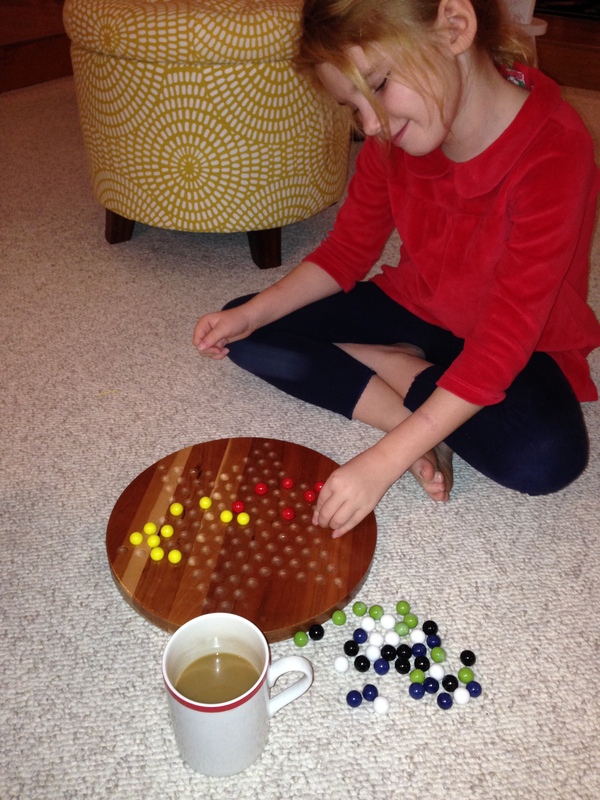 We have been spending almost every night in our—ahem—parlour playing classic games like dominoes, Chinese checkers, chess (the kiddos are learning), and various other games. We play songs on the piano before bedtime. 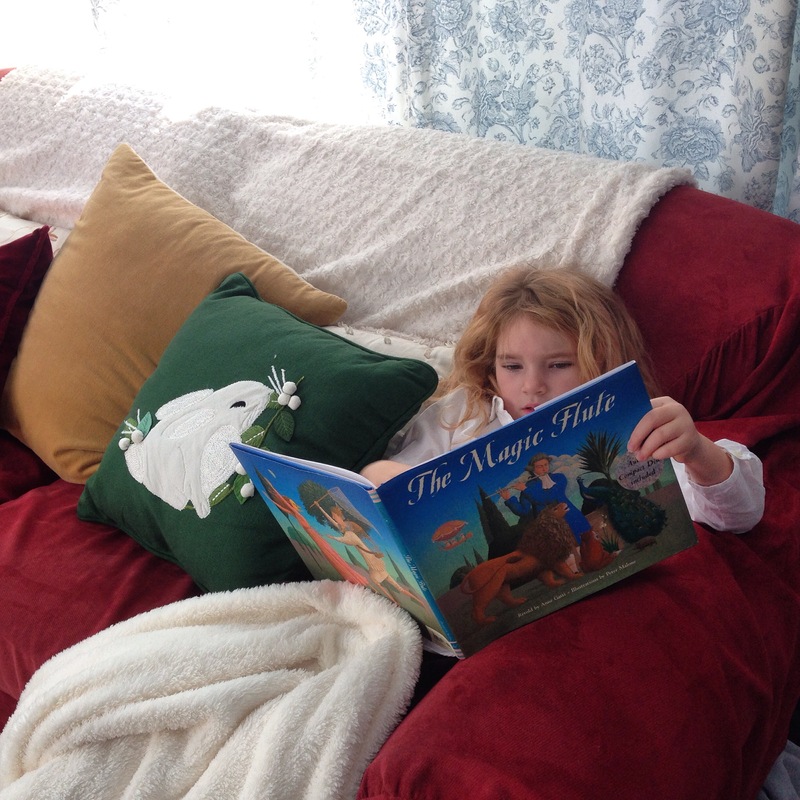 And I love, love, love to read in the new space after everyone goes to bed or after early morning training. This room—once a room I would practically run past—is now my favorite room in the house. Special mementos I had hidden on shelves—a vase from Rhodes, Murano glass from Venice, a favorite music box, my great-grandmother’s tchotchkies, and more—are finally in an open place where I can enjoy them. This room definitely has the most personality of any room in our house now, and I feel most myself in there. I am surprised, to an extent but also not really, to discover how much of myself I find at the piano. My fingers cannot wait to play each day and my voice to sing. Schooling at the McGaugh Academy continues robustly. Here, we did a sound energy lab. And Katie’s current passion is “The Magic Flute,” which she listens to in the original German. We have a book that narrates part of the opera and then indicates which selection to play on a CD. We treated ourselves to a restaurant that has been on my wish list for quite some time: E.A.T. (Extraordinary Artisan Table). 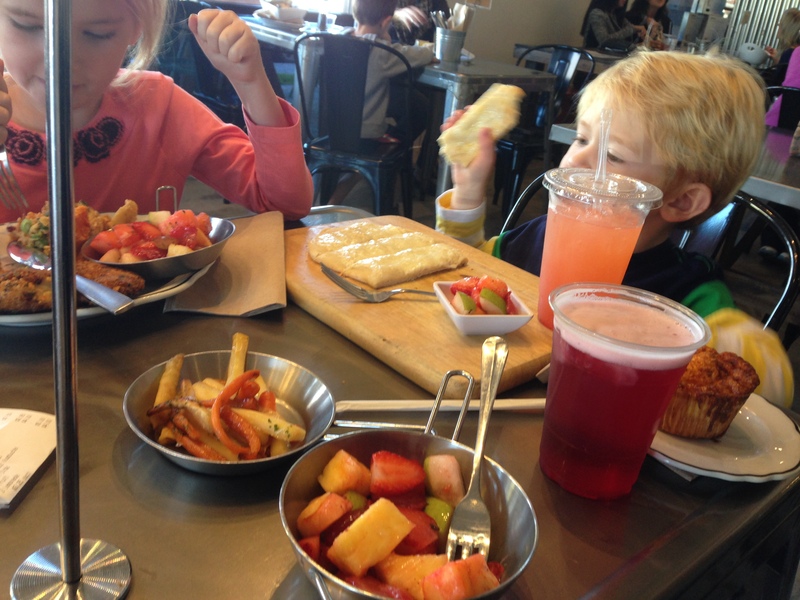 They source locally as much as possible, make their own almond mylk and kombucha…and frankly, it may be some of the most delicious food in Temecula. Katie and Eric devoured their lunches, including parsnips. In fact, lunch the first day was so incredible, we turned right around and went back for breakfast the next morning. This is a must-do restaurant in town. It lived up to everything I’d heard, and moreso. Embracing my quirky flag: this snowball (which I found once again during my semi-annual deep clean of the freezer) is not, folks, from this last snowfall. No, no, no. This is from the TIME BEFORE last in the early 2000s. My brother had just gone off to college at Berkeley, and I didn’t want him to feel left out or like he missed Temecula’s rare snow event. I made him a snowball that morning and froze it for him. 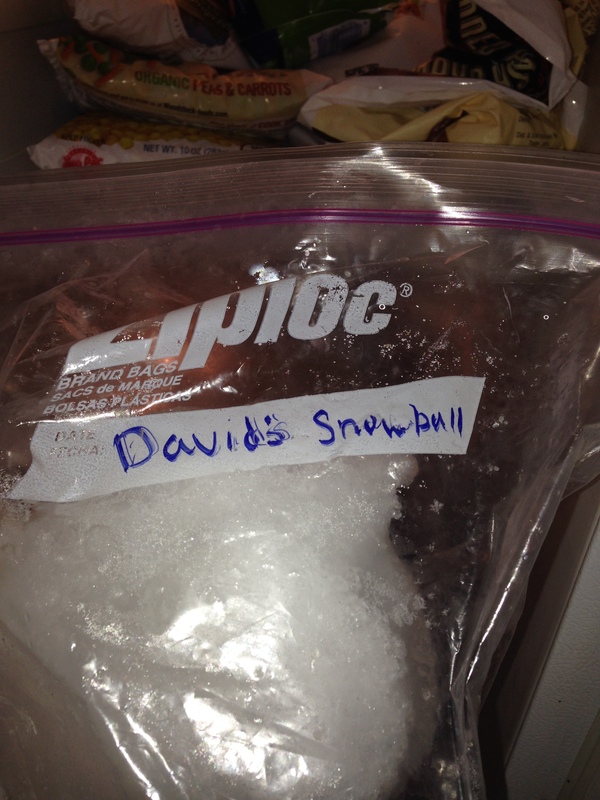 The kiddos now call it “Uncle David’s snowball.” It has survived several deep cleanings of the freezer for over ten years, and a move. 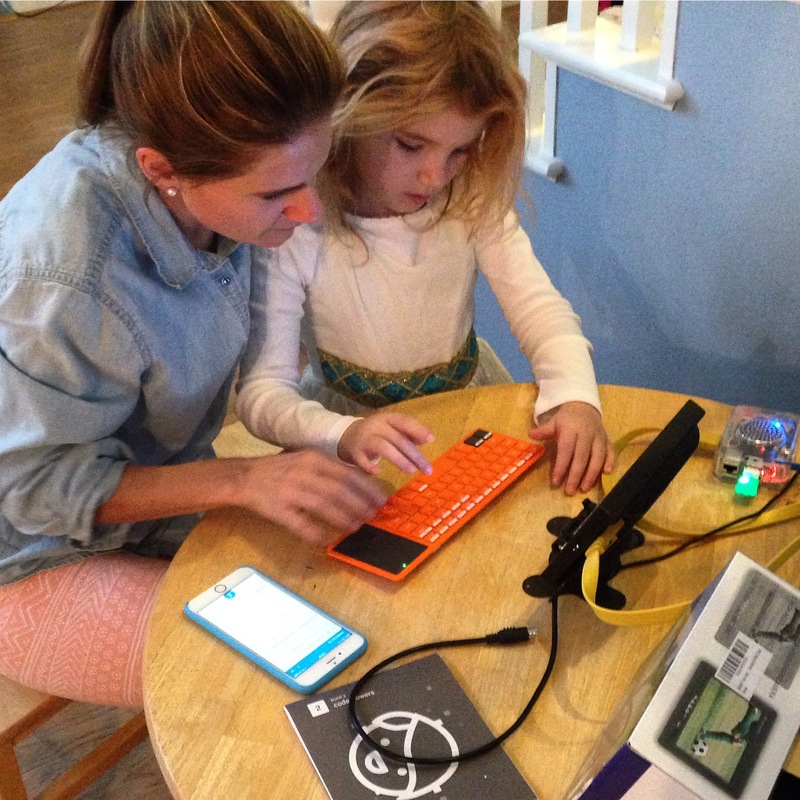 Coding in Sonic Pi on the Kano: we figured out how to program simple songs using code. Eric also writes his own. 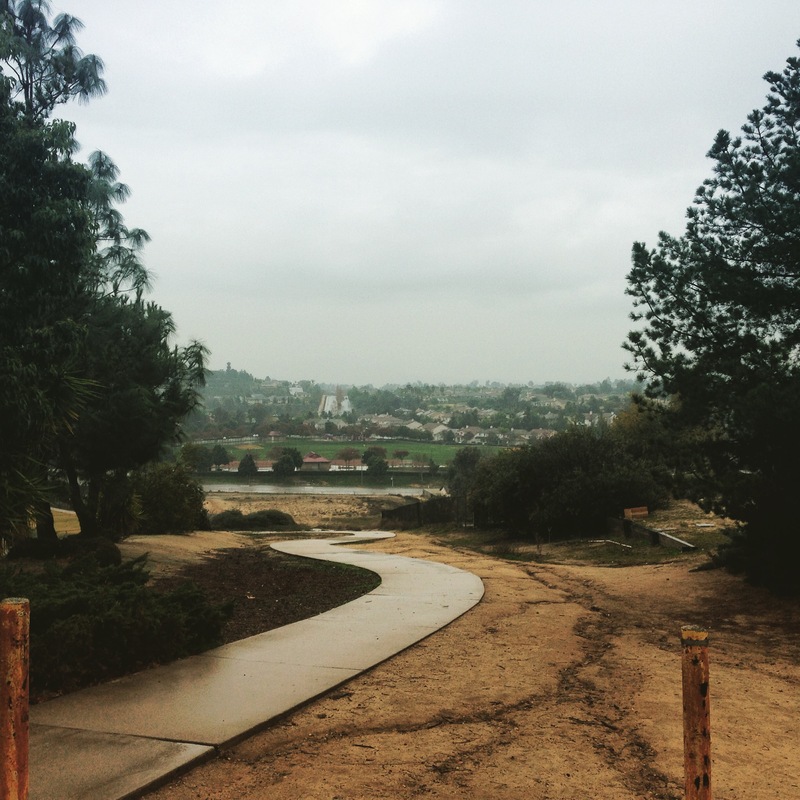 Ten miles last Sunday in the rain…. But I would rather run that, than run in snow or in 39 degrees…I’ve discovered. Training is going well. I have been running doubles (morning and evening runs) to drive up my mileage, and although it can be tough, I know that hard work earns speed. I am also swimming three times a week still, and I have slightly increased that distance, as well. Instead of 1 X100 lengths and 2 X 60-70 lengths, I am now doing 280 a week, for four mile swim weeks. It is a slight increase, but the extra 10 lengths every seven days will equate to an extra mile I didn’t have on average. I am going to conquer the 100 mile swim year…somehow! The craziest day of training this week was Wednesday: a 6 mile base in the morning, followed by three miles of intervals at the track, another three miles of running to and from the track, and a 13th walked mile of rest in between each set of intervals. Followed by a 9 mi Thursday… But if I want to get really good, then I have to work harder than I have been, right? And my friend Steve is here, tonight in fact, in advance of his Spartan Beast tomorrow. He is setting about to complete his second trifecta. 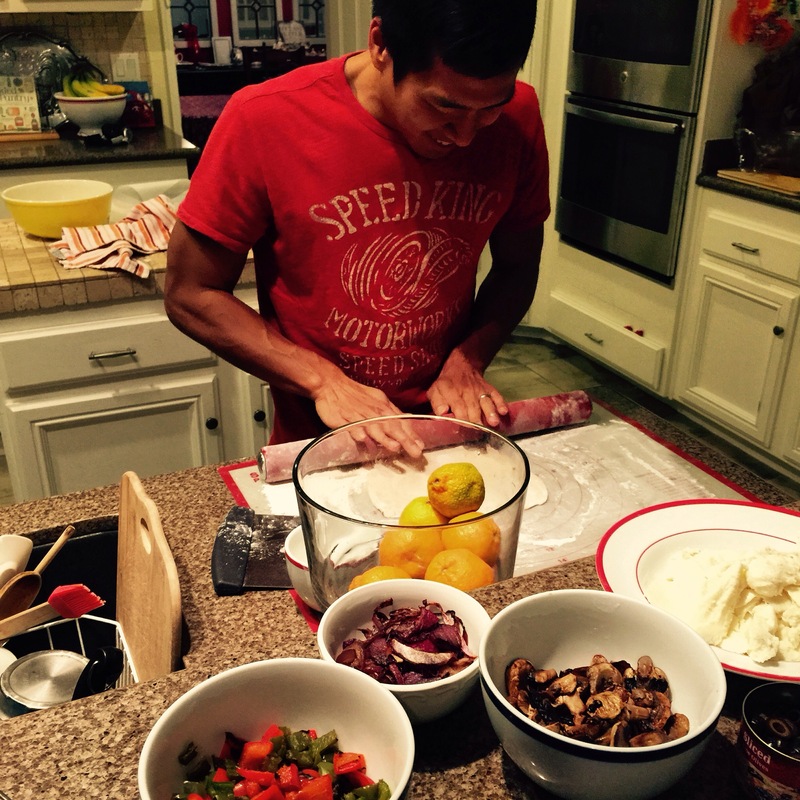 We had a make-your-own-custom-pizza Pizza Bar for dinner tonight. So fun to have him! Finally, I have not grown remiss about my monthly reading plan. Because December was so very full of choices and the need to balance everything at once (it felt), I read only three full books and halves of two others. So, not quite five. I figured I would catch up this month (so far, so good) and then post December/January together. As long as I keep an average of five books per month, I will be doing all right on the goal I set last summer. Steve brought a new book about running that I am dying to start, and I am in the middle right now of a book that is essentially the first sci fi written by a Chinese author. I am eager to see how the eastern point of view becomes science fiction. Katie and I have been reading Malala’s book (and have finished—more later on that), and now we’re reading a nonfiction book about Washington’s spy networks during the Revolutionary War, and both kiddos and I are reading Abel’s Island. My words are at such a paucity that I fear trouble mustering even a conclusion. So dash, dash, dash one on! Trying to get those words aflowin’.